Eshara Villas - an elite haven - Seminyak, Bali, Indonesia - Great discounted rates! Located in Seminyak, Eshara Villas - an elite haven is a perfect starting point from which to explore Bali. The hotel has everything you need for a comfortable stay. Facilities like free Wi-Fi in all rooms, private check in check out, express check-in check-out, Wi-Fi in public areas, car park are readily available for you to enjoy. All rooms are designed and decorated to make guests feel right at home, and some rooms come with television LCD plasma screen, internet access ?ÛÒ wireless, private pool, air conditioning, wake-up service. Access to the hotel's outdoor pool, indoor pool, spa, massage, garden will further enhance your satisfying stay. 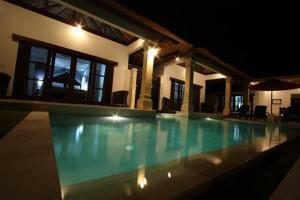 Eshara Villas - an elite haven is an excellent choice from which to explore Bali or to simply relax and rejuvenate. Eshara Villas - an elite haven - Bali classifies itself as a 4 star hotel.